Hey Handsomites! 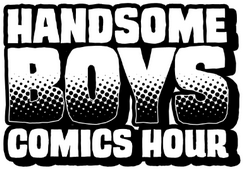 Eric and Robbie are discussing Hip Hop Family Tree this week! They talk about Piskor’s design choices, how he shows the history of hip hop, and the value of using comics to tell it! They also review The Batman Who Laughs #1 and Fence #1! This entry was posted in Episodes on November 21, 2017 by Robbie Dorman.